On Feb. 5, Lawrence hosted a talk with professional genealogist Kenyatta Berry, one of the hosts of the PBS series “Genealogy Roadshow.” The event was introduced as a component of Lawrence’s Black History Month 2019 theme of migration, and featured Berry being interviewed by Karen Nelson, the diversity coordinator for Appleton’s Mayor’s Office. She is particularly interested in the genealogy of slavery, saying, “It helps us find our people in spite of families having been torn apart by slavery.” Slavery poses many intricacies for tracing family lines. For example, there exists what is known as the 1870 Brick Wall; this was the first census that enumerated former slaves. Going back beyond this is difficult, and even in 1870, the census would name a household but not the relationships of the people in it, adding an additional obstacle for genealogists. “There is a common misconception among African-Americans that we cannot find our people because they were slaves,” Berry said. “This isn’t true; we can always find them.” She remarked that one of the most crucial elements of enslaved genealogy is the unfortunate fact that slaves were property. It is connected in some form to most ways of tracking enslaved ancestors down. For example, one could look for a slavemaster’s record and find slaves under their name. Another example is the migration of slaves in southern states occupied by the Union. Once these states fell, slaves became contraband and were taken to states like Texas where slavery was still legal. Galveston, Texas, for instance, was the last place in the US to outlaw slavery, doing so a few years after the Emancipation Proclamation was signed, and was just one of the havens where slaveholders kept their livelihood going. Berry devoted a part of her talk to the details of DNA testing. She said, “DNA doesn’t tell the whole story, since you still need birth, death and marriage records. But it’s still very useful and you have a lot of options available.” She mentioned that you can have a test done where your mother and father are each half of the DNA (autosomal testing), one where it traces your surname, and you may even be marketed tests related to your physical fitness. Berry did have a few warnings, however. She said, “Many companies like to sell your DNA, which may be a privacy issue for you. You also need to be prepared to be shocked; I’ve heard stories of people being tested and finding out they have children they weren’t aware of.” The conclusions is clear: research the company you’re testing with carefully, and read the terms and conditions of the test. For those interested in their own genealogy, Berry had a few suggestions. 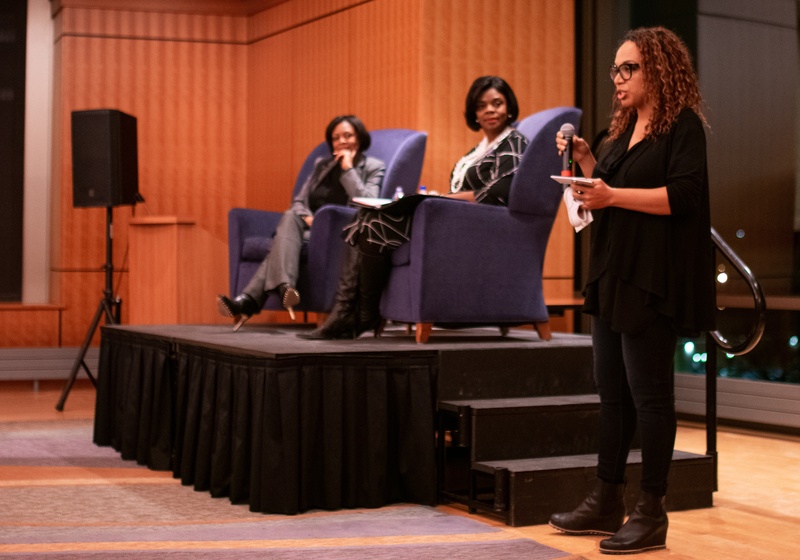 One audience member, whose family is from Haiti, felt they did not know where to start; Berry said that the best first step would be to learn the history and find out about the patterns of immigration and migration. Berry also gave a few examples of useful sources of information, namely city directories, cemeteries and draft registrations. And members of the Lawrence community have a local option: the Appleton Public Library is currently offering resources to guide people through genealogy projects. Genealogy has become more accessible than ever, and at the very least provides interesting personal information. For African-Americans, its significance is even greater, as it sheds light on a connection to people that was forcibly broken over the course of history.